FRANKLIN, Mass. – Coming off of a 12-6 win over Canton, the Franklin softball team knew it would have to continue its success at the plate to get a win over Stoughton. The Panthers did that as its offense started fast and came away with a 12-2 win over the visiting Black Knights on Wednesday afternoon. After Emily Valentino (complete game, seven hits, 11 strikeouts) set Stoughton down 1-2-3 in the top of the first, Franklin got right to work in the bottom half of the inning as Tara Hartnett (1-for-1, two walks, two RBI) hit an RBI triple to bring home Anna Balkus (2-for-4, two RBI), who reached on a bunt single earlier in the inning. After a scoreless top of the second, Franklin got back at it in the bottom half of the inning, sending every batter to the plate as Meg Caron led off the inning with a single, and after a lineout, Gabby Colace singled. A force out at third left Franklin with runners on first and second and two outs, but Balkus singled home Colace to put Franklin up 2-0. Kylie Bouzan followed that up with an RBI single, and following a walk by Hartnett, Jackie Cherry scored two on another RBI single. Maddy White then singled home Hartnett to extend Franklin’s lead to 7-0. “We did it all [offensively] with two outs, which really makes me happy,” said Franklin coach Kate Fallon-Comeau about Franklin’s offensive output. In the bottom of the third, Colace reached on an error and was moved over to third after a double by Ally Shea. After a throwing error at first on a Balkus bunt, Colace and Shea both scored to give Franklin a 9-0 lead. They would threaten with runners on second and third but a flyout would end the inning. 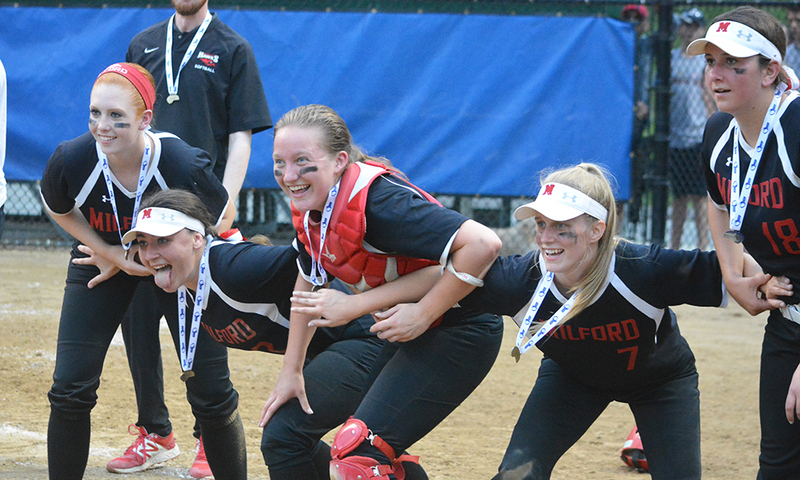 In the top of the fourth, Stoughton started to come alive offensively, as Nikki Coppola led off the inning with a single, and after a groundout by Jordan Lyons, Gina Carafa hit a double that one-hopped the right field wall and allowed Coppola to score. Lexi Baptista then drew a walk, and following a single by Taylor Levine, Stoughton had the bases loaded. Another single by Stoughton catcher Bri Ferrandiz scored Carafa and cut the Franklin lead to 9-2. Valentino managed to get the last two outs via the strikeout, and that inning was the only minor hiccup she would have all day. “She threw a nice game, mixed her locations, mixed her speeds, had a nice game with her command today,” Fallon-Comeau said about Valentino. In the bottom of the fourth, Franklin hit the run column again, as a sacrifice fly from = Caron scored White after she tripled, and Franklin took a 10-2 lead. In the bottom of the fifth Franklin scored on another sac fly, this time from Hartnett which scored Shea. In the bottom of the sixth, Natalie Stott, pinch-hitting for Cherry, singled home Bouzan to score Franklin’s final run of the game as the walked away with a 12-2 victory. Franklin (4-4) will look to keep their bats hot against Sharon (0-7) on Thursday afternoon at Sharon High School. Stoughton (2-6) will look to rebound on Friday afternoon as they host a talented Taunton team (7-2).